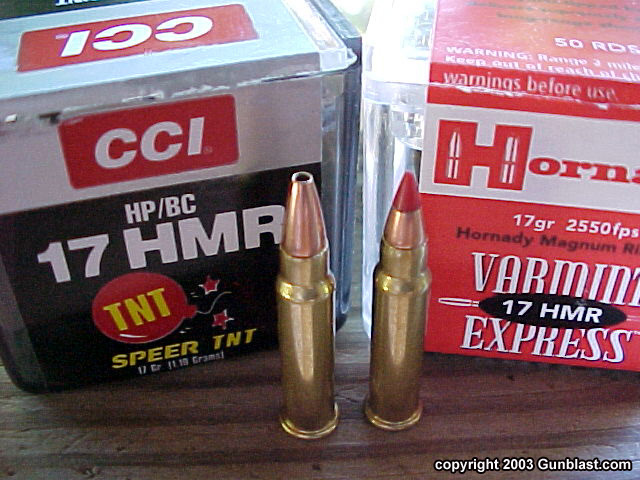 Since the introduction of Hornady’s little seventeen caliber rimfire cartridge almost two years ago, I have fired hundreds of them through several different guns. I am still surprised at times by the accuracy of the little cartridge. Out of a twenty-two inch rifle barrel, the .17 HMR leaves the muzzle at over 2500 feet per second. 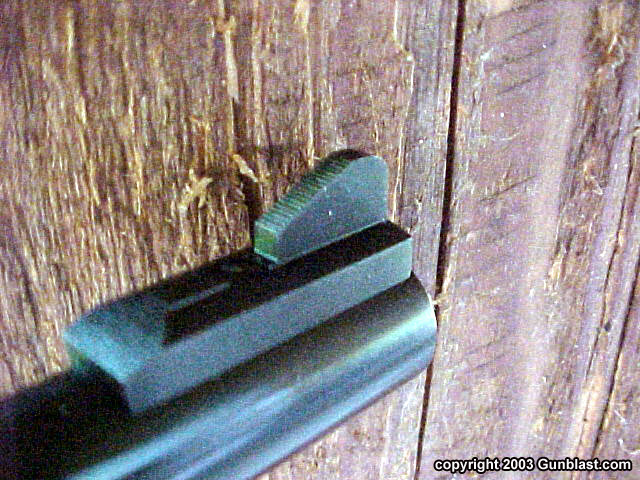 The trajectory of the seventeen is also much flatter than that of any other rimfire cartridge. I have tried the .17 HMR in several rifles and one revolver, not counting the Ruger Single-Six, which is the subject of this article. Ruger’s new .17 HMR is built on their New Model Single-Six frame, which has been in production for thirty years now, and incorporates Ruger’s transfer bar safety mechanism, allowing the safe carry of a fully loaded cylinder. The Single-Six revolvers are very popular, and the .17 HMR cartridge is well suited to the little sixgun. The Single-Six .17 HMR has a six shot cylinder, adjustable sights, rosewood grip panels, and is made of blued steel and black anodized aluminum. 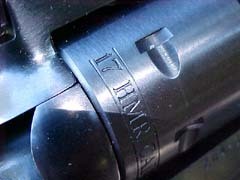 The only barrel length available at this time is six and one-half inches. The American Rifleman magazine had a review of this gun in their September 2003 edition, and this would be a good time to clear up a couple of errors reported in their article. 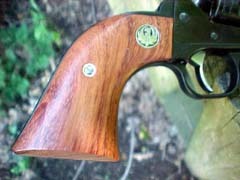 They erroneously reported that the sixgun has a six inch barrel and walnut grips, and this has caused a bit of confusion. It is obvious from their own photos that the gun has rosewood grips and a six and one-half inch barrel, just as does the sample that I have here for testing. The .17 Single-Six has a nice blue-black finish, and the aluminum grip frame and ejector rod housing match the finish of the steel parts very well. 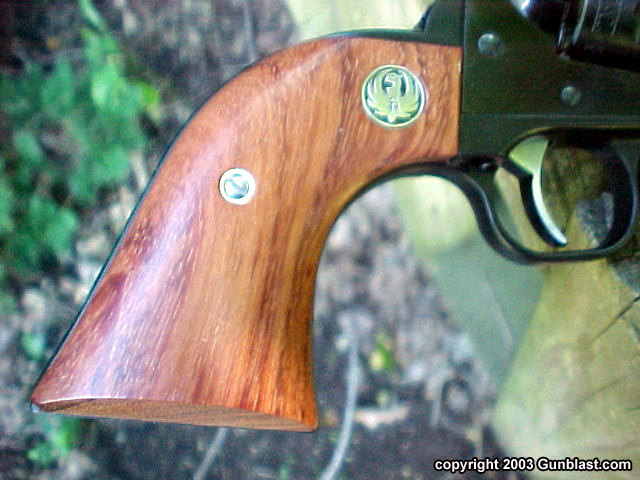 The rosewood grip panels are fitted very well to the grip frame, much better than some Rugers that I have seen in the past few months, and are inlaid with the Ruger silver eagle medallions. The sights are square and black, just as they should be, and the rear is adjustable for windage and elevation. 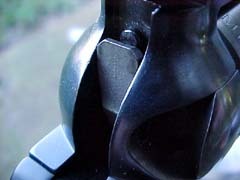 The sides of the hammer and trigger are polished and left in the white. The trigger pull on the seventeen measured five and one-half pounds, but after a quick poor boy’s trigger job, now breaks cleanly at three pounds and one ounce. The barrel has six grooves with a twist of one turn in nine inches. 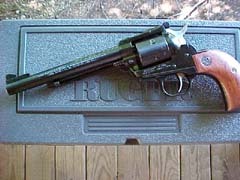 While the Single-Six has a smaller frame, the grip frame is the same size and shape as Ruger’s larger Blackhawk, and the little sixgun balances well, weighing just under 36 ounces. 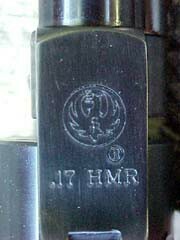 The cylinder length measures 1.406 inches; just right for the .17 HMR cartridge. 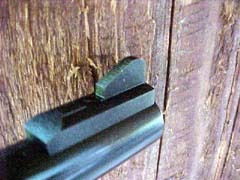 The barrel to cylinder gap measures a consistent two one-thousandths of an inch (.002"), and there is no perceptible end to end play of the cylinder. The little sixgun is very well fitted. The Single-Six comes supplied with a hard plastic storage case, cable lock, and instruction manual. 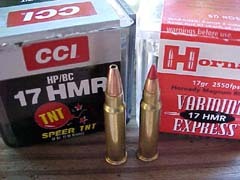 For accuracy and functioning testing, I had a supply of Hornady 17 grain Varmint Express ammunition along with some CCI 17 grain TNT hollow point ammo. Range conditions had calm winds and an air temperature of seventy-eight degrees. 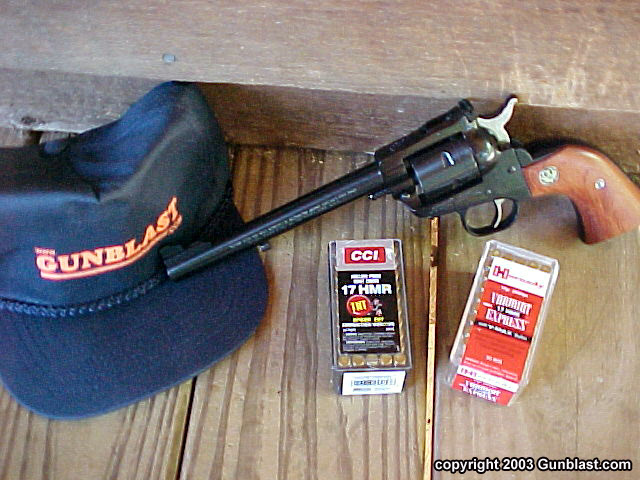 From the Ruger’s six and one-half inch barrel, the CCI ammo averaged a speed of 1944 feet per second, and the Hornady clocked in at 1993 fps, all at a distance of ten feet from the muzzle. Initial accuracy testing was at a distance of twenty-five yards using a rested position. 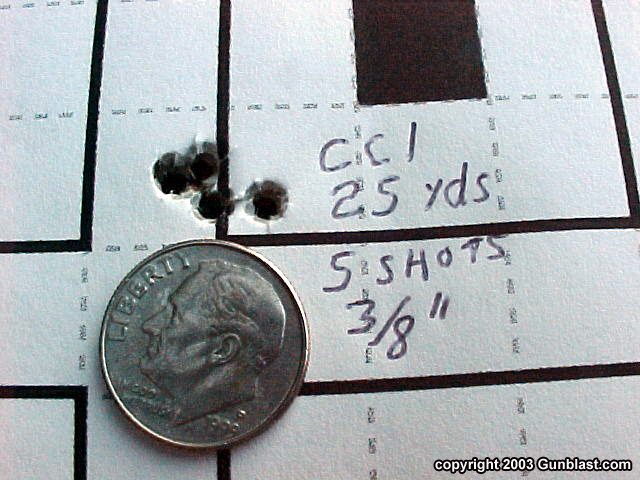 Accuracy of the little Ruger with the open sights was good, with five-shot groups measuring just over one and one-half inches. However, the groups showed almost no vertical stringing, but the largest spreads were on the horizontal plane, which to me indicated shooter error. In other words, I wasn’t holding the gun consistently from shot to shot. While one and one-half inch groups ain’t bad, I suspected that the gun could do better, so I decided to see if a scope sight could help me to hold the gun more consistently. 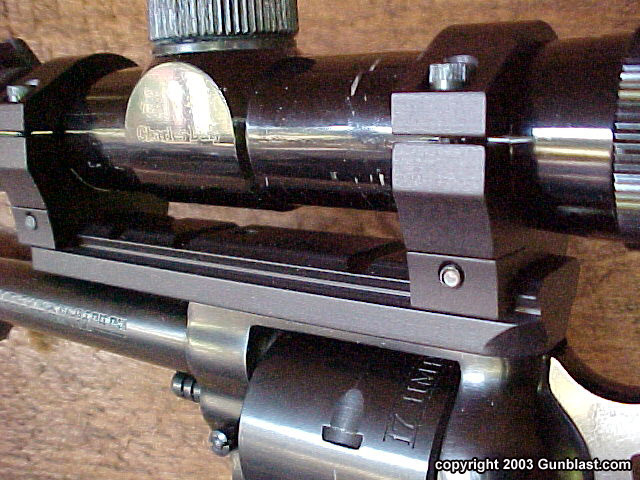 An inquiry to Weigand Combat Guns quickly resulted in the arrival of one of their excellent no-gunsmithing scope bases, along with a set of their scope rings. 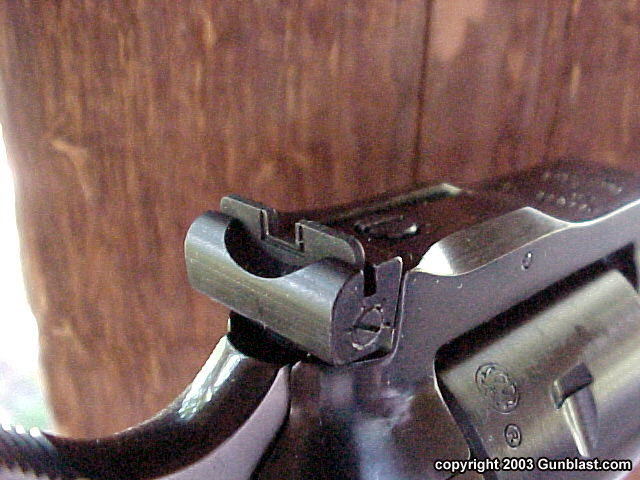 The Weigand scope base only requires the removal of the rear sight, and does not permanently alter the gun. 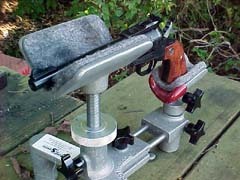 The whole scope mounting operation took only about five minutes, solidly mounting an old Charles Daly two power scope atop the little Ruger. I expected the group sizes to shrink with the scope, but I was definitely surprised at how tight the groups were. As can be seen in the photos, this Single-Six really can shoot! That is a dime used for comparison in the photos. 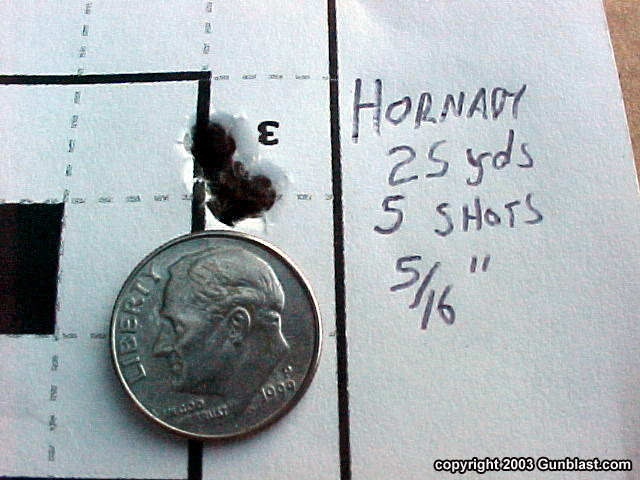 The Hornady ammo grouped five shots into just five-sixteenths of an inch at twenty-five yards, and the CCI grouped five into just three-eighths of an inch. Moving the target out to one hundred yards resulted in five shot groups measuring just under one and one-half inches, with a slight wind on that day. I must confess that I never would have thought that the Single-Six would be this accurate. 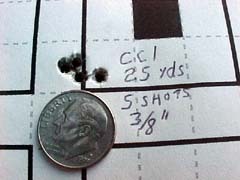 For a six shot revolver, especially in the Ruger’s price range, that is amazing accuracy! Even after the little seventeen got dirty, there were no failures to function of any kind. Ejection was smooth and easy, with most empties falling out of the cylinder without the aid of the ejector rod. The Ruger .17 HMR Single-Six balances well and points naturally in my hand, which has become very familiar to the feel of a single action over the years. The Ruger would make a dandy little sixgun for pest and small varmint control out to about 125 yards with the issue sights, or a bit further with a scope mounted in the Weigand Combat base and rings. The .17 extends the practical range for rimfire handgun plinking, shooting faster and flatter than the .22 magnum. 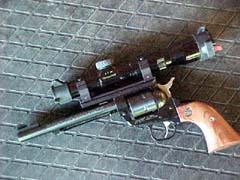 Out of a revolver, the seventeen beats the velocity of the .22 magnum by about 500 feet per second., and flattens the trajectory considerably. 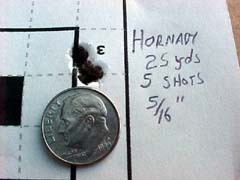 Once again, I have been impressed by the accuracy of the .17 Hornady Magnum Rimfire, and equally impressed by the performance of this Single-Six. 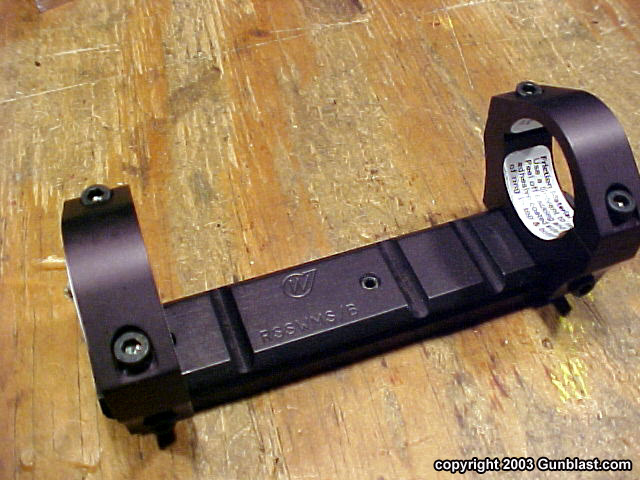 For more information on, or to order one of the Weigand Combat mounts, go to: www.jackweigand.com. If you have a handgun that needs a scope mount, chances are that they have one to fit. 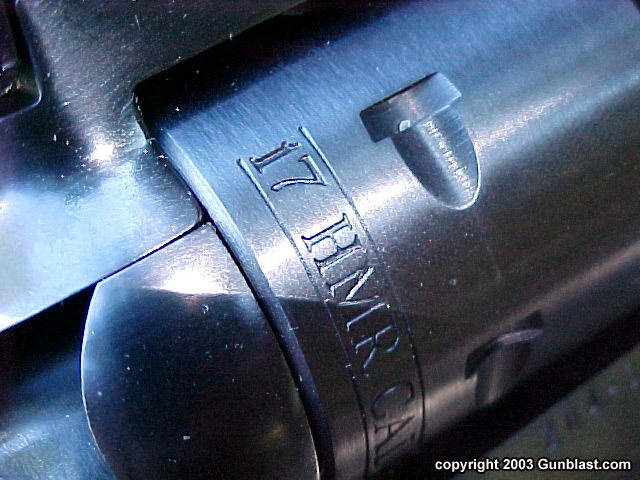 The excellent .17 HMR cartridge has found a new home in Ruger's Single-Six revolver. The proven design of Ruger's Single-Six is a natural fit for the little .17 HMR. The Single-Six .17, like all their New Model sixguns, features Ruger's transfer bar safety system. This allows the Single-Six, unlike older Single Action revolver designs, to safely carry a fully loaded cylinder. The Single-Six .17 features a well-fitted set of rosewood grip panels. To aid in accurate shooting, the Single-Six .17 features a ramp front sight, fully-adjustable rear sight, and a recessed muzzle crown. 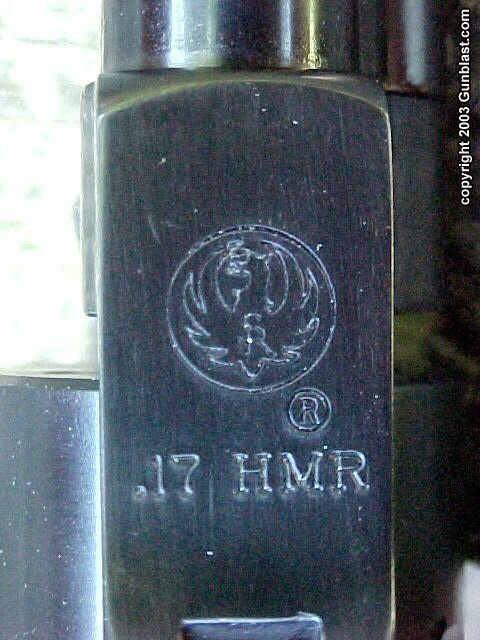 Both CCI and Hornady factory ammo have proven to be very accurate in other .17 HMR guns the author has tested, and Jeff looked forward to seeing what the .17 HMR would do in a Ruger Single-Six. 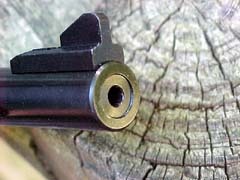 The Single-Six .17 was fired for accuracy from Jeff's Target Shooting, Inc. gun rest, and showed good accuracy with iron sights, but Jeff believed that iron sighs really didn't do the gun / cartridge combination justice. 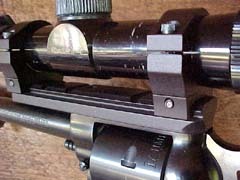 To really see what the Single-Six .17 would do, Jeff mounted a scope in one of Weigand Combat Guns' excellent "no-gunsmithing" scope mounts. Author was honestly surprised by the consistent level of accuracy shown by the scoped Single-Six .17 . That little Ruger sixgun shoots like a rifle! Long a fan of Ruger sixguns, Jeff learned that our friends in Southport, CT still have a few aces up their sleeves! For short-range varminting or just plain fun, the Ruger Single-Six .17 can't be beat.